Tie intelligent and modern climate control into your home automation system with SAV Digital Environments. Maximize efficiency, convenience, and enhanced levels of comfort within and throughout your environment. With intuitive, full-color high-definition touch displays, and smart devices, that are easy to read and understand, you will be able to customize and enjoy your space without limitation. Let your climate technology adapt to your home's heating and cooling cycles to help deliver the optimal temperature at the right time, or take full control and customize your comfort levels at a moments notice. Your ideal comfort will also follow you and your family over the course of your day by adding smart room sensors. Your environment will know which rooms are occupied and which ones aren’t. Giving you with total peace of mind and maximum home comfort, always come home to comfort and save energy when you're away with geofencing technology on your smart phone. 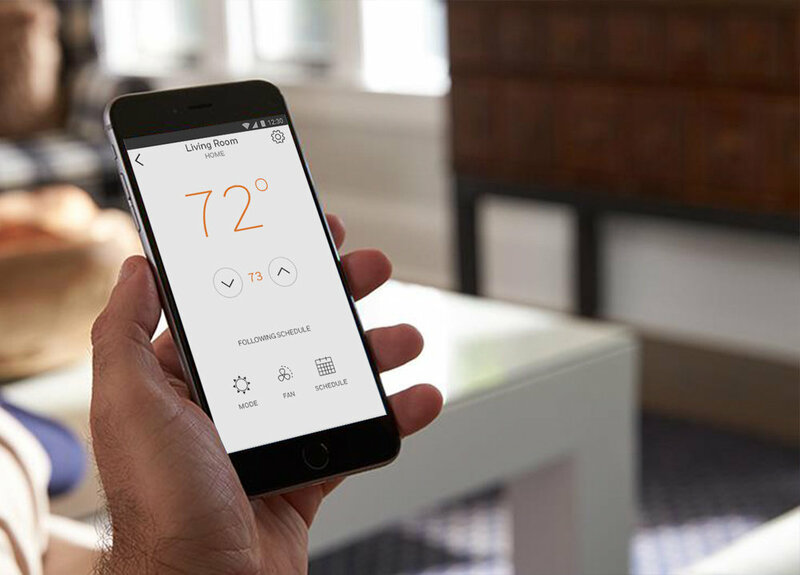 Allowing for more than one user at a time across multiple devices, extend access to other members of your family who control and monitor the household thermostat too. It's that simple and efficient. No more wasted energy when you’re out and stop coming home to a cold house. It’ll even let you know humidity levels, when the filter needs changing, and when the temperature outside rises or drops outside of your threshold.